The number of tools used by sales and marketing teams only continues to grow, and with that expansion of options, it is more crucial than ever that you ensure your budget and time is being spent on the right tools. At Intercom, we want to make it easy for our customers to see the value of building real relationships with leads and customers. That’s why we recently released our new revenue and sales team performance reports, which gives marketing and sales teams instant visibility into how using Intercom has a positive impact on their business. 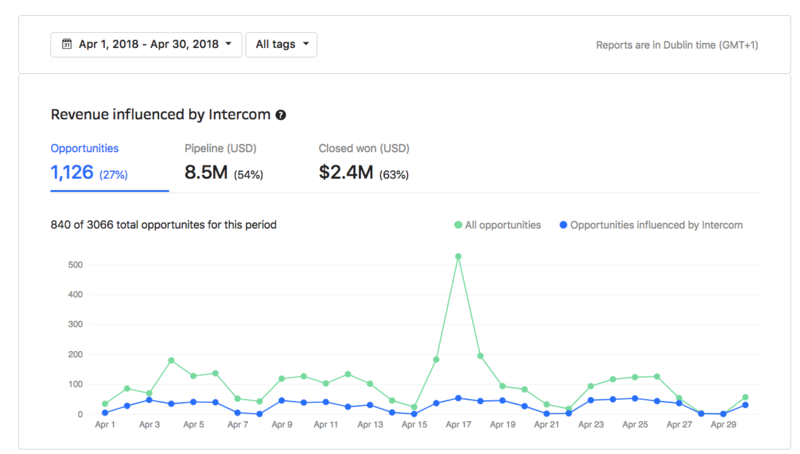 Combined with a simple Salesforce integration, these reports will give you deep, actionable insights into exactly how Intercom is helping your marketing and sales teams create real revenue. They surface the most useful analytics and data to help you maximize Intercom’s impact on your business. The new Revenue Reports show your marketing and sales team the figures that matter. You can instantly filter by date range and tag to see how many opportunities and how much revenue Intercom has influenced, as well as the total leads and emails captured. ‘Influenced by Intercom’ means the lead had a conversation in Intercom less than 30 days before an opportunity was created and closed in Salesforce. ‘Pipeline’ refers to the dollar value of those opportunities. ‘Closed won’ shows the number of opportunities who have been assigned the ‘Closed won’ state in Salesforce. 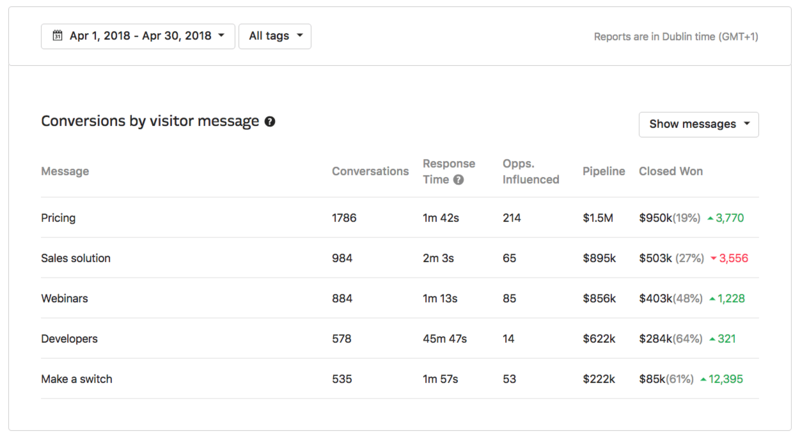 You can see which pages and messages on your website generate the most opportunities, pipeline and revenue, along with total conversations and your average response time. This allows you to identify which messages are actually working and creating value for your business, but also allows you to focus on using Intercom in the right places on your website. For example, you might discover that your homepage creates a lot of conversations, but those conversations generate less opportunities. Conversely, you might find out that your pricing page has fewer conversations, but creates many more opportunities. Armed with this knowledge, you could focus on reducing response time for conversations that come from your pricing page. Want to compare performance of different sales teams or teammates? Now it’s easy. Compare opportunities, pipeline, deals won, meetings booked and the median time to close opportunities across a specific date range. 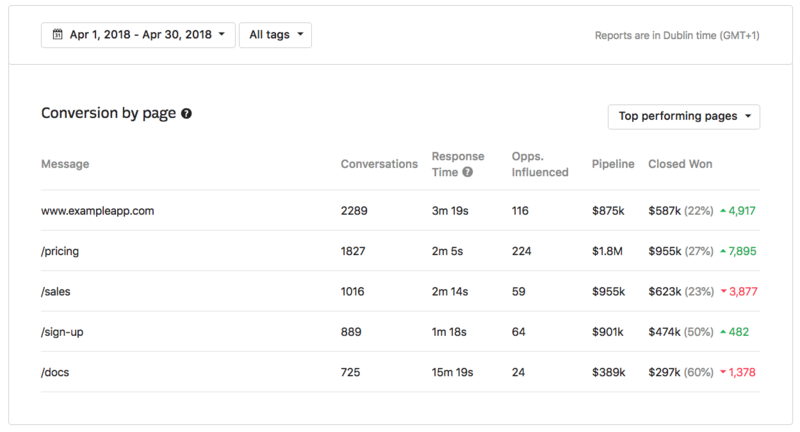 Sales leaderboards are great for seeing who’s closed the biggest deals and beyond that, Intercom shows you how many conversations teammates had to have in order to close those deals, their response time and the time it took to close. When looking at the performance of an entire team, you can see at a high level who is having the most conversations, their response times, opportunities, pipeline and deals won. Then you can dive into their individual stats. If you’re considering trying Intercom on your sales and marketing team, there’s never been a better time to do so. Our library of powerful apps in the Intercom App Store and automated Custom Bots and Video Bots will help you stand out from competitors, and with these reports you’ll have more insights than ever before into how Intercom is helping you grow your business faster. Revenue and Sales Team Performance Reports are available on our new Inbox Premium plan. If you’re interested in trying them out, head over to our pricing page and click “Chat with us”!